How long should a blog last? It's a question, I guess, that more and more bloggers will be asking themselves over the next year or so. This one has lasted just over 21 months which isn't bad but I feel its time has come. The online world has changed a lot in the past couple of years. When I started in January 2008, with the specific purpose of recording my progress writing The Frugal Cook book, there weren't nearly as many blogs as there are now. But the big change has been Twitter which has in some ways made blogging superfluous - especially if you already have a website. I know you can't tweet a recipe but you can tweet ideas with an immediacy and an effectiveness it's hard to match in a blog. It's also true that you can get to a stage of casting round for things to write about, particularly if your remit is as narrow as frugal cooking. I do write about other aspects of food and drink which I'd like to explore more. I don't want to get to the stage of repeating myself. Of course I won't give up writing about frugal eating altogether - after all I've always cooked frugally - but you'll now find my recipes and tips on my student and budget eating website Beyond Baked Beans. Anyway thank you all for visiting, for reading and for sharing. This blog has been richer for it. The other day I roasted a mallard duck (which I'd found at a good price at our local butcher, I hasten to add). Mallards are quite small so there was only enough for 2 plus a carcass with a fair bit of meat on it for stock. I left it overnight in the AGA and the result was superb so I started thinking of dishes to set it off. Beetroot risotto, inspired by a recipe from The Larder Lout, one of the students who collaborated on my recent student cookbook, emerged at the top of the list but I hadn't got any beetroot and had run out of risotto rice. I also fancied some horseradish in it and a dollop of crème fraiche so ended up spending over a fiver to make a dish for two - not so frugal after all. It made me think how relative frugality is. If I'd already had most of these ingredients in the fridge or storecupboard - apart from the beets - it wouldn't have been expensive. Good cooks tend to have well-stocked storecupboards. Less well-off and less knowledgeable ones like students don't so are not generally able to make such interesting and complex dishes. The knack of frugal cooking - which I occasionally forget in my enthusiasm - is to be able to make a delicious dish from not a lot. Heat 2 tablespoons of the duck fat in a large sauté pan or saucepan and cook the onion and thyme over a gentle heat until the onion is soft. 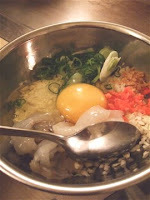 Season with salt and pepper, increase the temperature and stir in the rice. Stir for a couple of minutes before adding the wine. When the rice has absorbed the wine, add beetroot and stir for few seconds then add a ladle of the hot stock. Continue to stir regularly, adding a ladle of stock each time the rice has absorbed the previous batch. After 17 minutes or so taste the risotto. It should be almost cooked with just a little bite remaining. Cook for a minute or two longer if not. Remove the thyme sprig and stir in in the parmesan, horseradish and crème fraîche. Add a final ladle of stock, turn off the heat, cover the pan and leave for a few minutes. Briefly fry the duck pieces in the remaining duck fat until crisp. 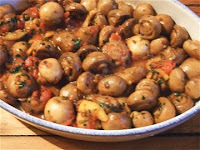 Remove from the pan with a slotted spoon and drain them on kitchen paper. Wilt the greens in the same pan, adding a splash of water if necessary. Season them well with salt and pepper. Stir the risotto again and dish up in warm bowls, topping with the stir-fried greens and the crisp shards of duck. How big a store-cupboard do you have - in terms of range of ingredients rather than physical size? And, another issue, if you have an extensive one, do you get round to using all the ingredients before they go out of date? It's been a super-frugal week in the Beckett household so far, thanks not to me but my husband who has been trawling for bargains in the local Co-op/Somerfield. As you may know the Co-op took over Somerfield some months ago and finally seems to be in the process of introducing its own lines. That seems to be good news in the case of fresh fruit and veg which have improved in quality and gone down in price. 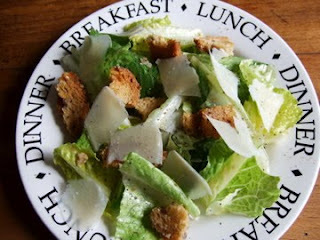 At the weekend he managed to pick up a decent-sized cos lettuce for 25p which I turned into a faux-Caesar salad (above) then yesterday proudly brought home some reduced sprouts (35p) and cheap parsnips (50p for a 500g pack) - with no particular purpose in mind, it has to be said. 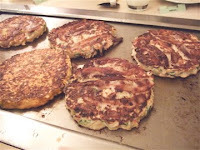 I initially wondered whether I could turn them into okonomiyaki (but then I'm wondering whether I can turn everything into okonomiyaki since my induction last week) but having consulted a couple of recipes I realised I hadn't got vital ingredients like tempura flakes. However I knocked up a makeshift stir-fry instead which actually wasn't half bad and which I've just posted on my student website here. The remaining veg together with some green beans I found lurking in the fridge went into a hearty minestrone-style soup along the lines of my Sad Unloved Vegetable Soup. 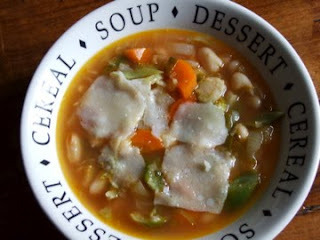 I added a spoonful of tomato paste (diluted with some stock) as I didn't have any fresh tomatoes, a frozen tub of home-made chicken stock I hadn't got round to using and a tin of cannelini beans and topped each helping with plenty of parmesan. It made easily enough for four so there are leftovers for my husband today while I go waltzing off to London. In both cases I grated rather than chopped the parsnips which I think gives a better texture - unless you're going to boil and purée them or roast them. 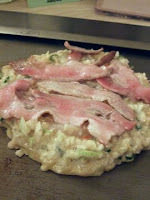 In fact I'm wondering if you could add parsnip - and even sprouts - to okonomiyaki . . . 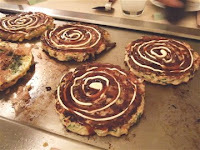 This week I was introduced to okonomiyaki by a couple of friends who had spent time in Japan. On the face of it it didn't sound that much of a draw - a sort of Japanese pancake with cabbage and various other bits in it - but after I'd eaten it I could completely understand why they'd been raving about it. In fact it's more like a particularly delicious bubble and squeak. You can order various varieties which are cooked by the server on a hot plate in front of you teppanyaki-style or at least you can at Abeno in Museum Street which is where we all went. I had a Tokyo Mix which included prawn, squid and belly pork (although it looked and tasted rather more like bacon) (plus spring onions, ginger and (according to the website) tempura batter. 3. She (or he but there were more waitresses) fries the bacon separately on one side on the hot plate then places the slices, cooked side down on the cake, then flips over the cake to cook the other side. This cooking process takes a good few moments, I'd say 5 minutes a side. 4. More flipping continues until the crust is beautifully brown. 5. Each cake is then sprinkled with ground nori, anointed with a sort of brown sauce and mayonnaise squirted in circles round the surface and dusted with a sprinkling of bonito flakes which amusingly flutter on the top like feathers. 6. 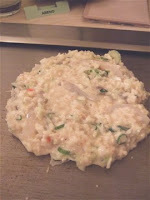 You then use a small palate knife to cut up your okonomiyaki into wedges (by this time you're quite starving) and eat it. With more mayo, chilli sauce and soy sauce if you want plus pickles like kimchee (fermented cabbage) and seaweed and cucumber pickle which we scoffed before we had even started. If you have much the same reaction as I did when I was told about it don't let it put you off. It really is one of the most delicious fast(ish) foods imaginable - a real umami flavour bomb. 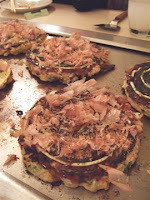 Not having an okonomiyaki restaurant in Bristol I'm trying to work out how to do it at home. It must be one of the ultimate frugal dishes . . .
No sooner have I said there isn't one in Bristol, I've discovered there is. Obento near the Old Fish Market for fellow Bristolian okonomiyakiphiles.